This page is the public place for my Fall 2015 undergraduate course Comics as a Way of Thinking at the University of Calgary. See extensive excerpts of sample student work from the course here! Course description: This course will explore comics as a unique and robust communication form, with an emphasis on understanding comics by making them. We will take a multifaceted approach to analyzing the medium, from uncovering comics’ historical roots and examining the various genres developed in the West and across the globe, to delving into the theoretical and formal elements, as well as considerations of comics in relation to other media such as film, poetry, and even architecture. Beyond narratives, we will look at the growing role comics are playing in the fields of journalism, education, and health/medicine. While making comics will be a significant component of the course, prior drawing experience is not required. Rather, we will expand upon what drawing means by creating spaces for students to play and explore the multiplicity of possibilities that emerge when we work in the bilingual fashion that comics facilitate. 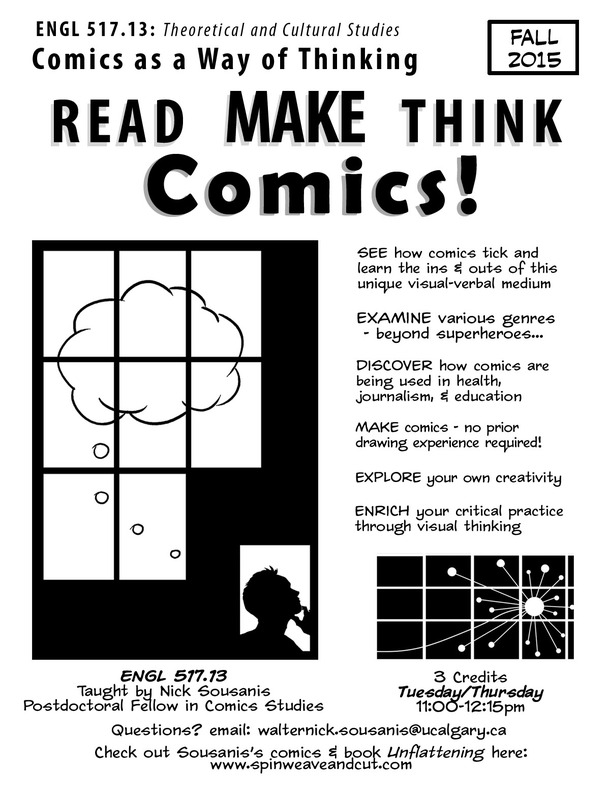 The course will serve as a springboard for students to develop ways to incorporate visual practices gleaned from comics into their own creative and critical work. Briefly on my teaching philosophy: I consider learning as acquiring the tools to follow one’s own curiosity, and thus teaching means providing a framework, establishing an environment for participants to explore and thrive. Rather than being out in front, I see my role as accompanying students on a journey we all make together. As a class, we all come from different backgrounds and offer distinct vantage points – we want to draw on all of them to expand the possibilities for what we can all learn as we each find our own way. I want to emphasize the importance of play as a form of learning – that doesn’t mean it’s not hard work, it’s that we learn by doing, by trying, by falling, by diving in with vigor and seeing what happens. Scott McCloud. Understanding Comics (Avon). All of the above are required for this course and are available in the bookstore. Additional shorter readings will be provided by the instructor or available online. We learn in community and gain from each other’s perspective. Let’s be here on time and respect one another’s point of view and discover what we can learn together. We want this classroom to be a great learning environment for everyone, so we need to all take care of each other to make it so. Laptops and smart devices, if used well, can complement discussion and so are permitted. If they are being used in a way that detracts from the overall environment, the instructor will address that. Attendance: Class functions best when we are all present to continue ongoing discussion. Of course, sometimes obligations, illness, or other unforeseen events make attendance impossible. If you know of an upcoming obligation or ongoing health/personal challenges that that will preclude your attendance, let me know in advance and we will make alternative arrangements. a variety of activities that may include comics-making or other drawing exercises, visual analysis/annotations of comics, responses to readings in comics form, brief presentations – introducing the class to a particular work or way of working in comics and its significance, others to be dreamed up by participants and instructor as we go! Emphasis will be placed on inventiveness, curiosity, effort, and willingness to dive in and try with vigor something you haven’t. Student evaluation will be based primarily on completion not skill – we want to build a portfolio of your explorations that should be rich in its depth. We will be keeping a notebook or journal for notes, exercises, and some specific visual journaling and notetaking explorations, drawing on the work of Lynda Barry, sketch-noting, and more. This is a chance to do your thinking through physical activity and visual representation. As with the description of Short Assignments above, attending to it with inventiveness is most valued. Midterm: at home, in-depth visual analysis/annotation of a small number of comics pages. Conduct an extensive exploration in comics or a related image-text form that demonstrates the use of comics within a particular context. This will be something related to your own work or area of interest. Alternatively: write up in more traditional form, an analysis of the usage of comics within a particular context, addressing its effects and ways it can increase understanding. Topic and format will be discussed in class and approved in conversation with the instructor, and as part of your final, you will produce a short proposal statement laying out the goals of the project. Everyone will make brief project presentations in our final sessions – completed projects are due one week after last meeting (Dec 15). What follows is a roadmap for our work together. It is not meant to be a rigid document, but something that will evolve as we explore and generate responses to the material we cover. As our course alters to accommodate new ideas and unanticipated detours, I will keep you all apprised in class and via email to ensure we all remain on the same page. Please Note, I have an opportunity to speak about my work in the United States and overseas on several occasions over the term. This will mean that I will have to miss a few class sessions – but as is noted in the schedule there will be special guests presenting on those days, this includes eminent comics scholar Professor Bart Beaty, UofC doctoral candidate Tom Sewell, and postdoctoral fellow Frederik Køhlert. Each will speak from their particular areas of expertise in comics and work within the general scope of our discussion. Sept 8 Course Map, Opening conversation on just what are comics anyhow? Caricature, Why does it affect us so much? Nov 19 A look at this growing field – starting from McCloud, Larry Gonick, ever-growing works produced intended to teach a topic, prevalence of author’s avatar, other approaches. Somewhere in here we will look at mini-comics…. Additional readings (Available either online, via the library website, or PDFs supplied by instructor on D2L) These will be made explicitly available and added to D2L. Kunzle, “Rodolphe Töpffer’s Aesthetic Revolution”?? Pat Grant Blue (online) and his dissertation?